For the past four years, we have begun our school year with a simple scavenger/treasure hunt. The prize at the end is always inexpensive and usually related to school. It only take maybe FIVE minutes at most, so there is no worry about derailing your schedule for the day. The past few years I have made cute printable with rhyming clues that I printed from my computer, but due to technical difficulties this year we just did simple post-its and silly clues. It is OK that the clues are easy because the object of the game is NOT problem-solving hard riddles. The object is to start school with fun! We have each boy take turns reading and solving a clue. Make sure you have enough clues for each of your children. Harry's Electronic Wand - Hand them this clue, or on front door as they begin hunt. It led them to our Wii Remote for their Harry Potter game. Variations- This can be any remote or video game you have. I would suggest "The TV's Boss" and put on your remote control. Germs Killer- Leads them to disinfecting wipes OR any soap dispenser in the house. The Stinky Place- Leads them to the bathroom of course....yes, I live with boys who enjoy bathroom humor. 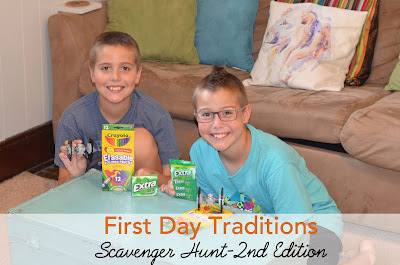 Their Prizes this year included Erasable Colored Pencils, a clearance Lego Star Wars ship, and a few packs of gum. You can do anything you want, keep it simple and inexpensive! This isn't Christmas day, just a fun way to begin your year with excitement. We took our first day of school pictures after the hunt. These always go better after they find their prizes, because they have real smiles.